Last month, the residents of Stonecrest at Clayton View received a very special delivery—three tiny cattle dog pups and three tabby kittens. 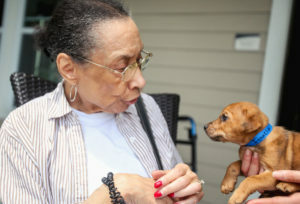 “I had dogs as a child,” says resident Darlene Murray, shutting her eyes, stroking a 5-week-old foster puppy brought by the Animal Protective Association of Missouri (APA). The APA’s FosterCare program was launched earlier this year and places animals still too young for permanent families into temporary foster homes. These animals, explains Ashton Keenan, FosterCare coordinator, include kittens and puppies anywhere from a few days to 8 weeks old. After that, they can be spayed or neutered and given to their ‘forever homes.’ Placing very young animals in foster homes also reduces exposure to illness during the early weeks of life and provides critical socialization. “This arrangement is a win-win situation for all involved,” Keenan says. 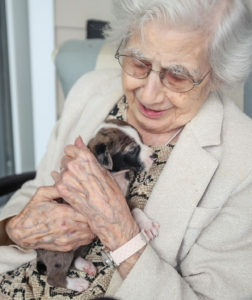 Brown adds, “Not only is it comforting for seniors to pet the animals, but it also gives them an outlet to talk about the past and the pets they’ve owned. Everyone gathers around and it becomes the highlight of their day.” Brown says the APA is hoping to expand the PetReach program to include domestic violence shelters. The nonprofit already partners with area agencies to provide temporary care for pets of domestic violence victims. Javier says there are plenty more seniors who are enjoying doggie kisses at Stonecrest at Clayton View in Richmond Heights, the site of the APA’s pilot foster program for older residents. Facilities around the St. Louis area already welcome animals for visits through the nonprofit’s PetReach effort, but there’s one key difference at Stonecrest – the puppies get to stay for slumber parties that sometimes last for weeks. 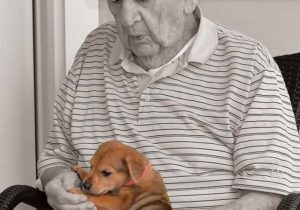 The puppies that the nonprofit brings for the Stonecrest elders to foster are only a few weeks old, and Javier says that it’s a crucial time for the younglings. By living at the facility with the seniors, the dogs learn to socialize and can build up their immune systems. Once they’re older and healthier, the APA brings them back to the home office to be spayed or neutered, vaccinated, microchipped and put up for permanent adoption. To date, Stonecrest has fostered three different pairs of puppies. 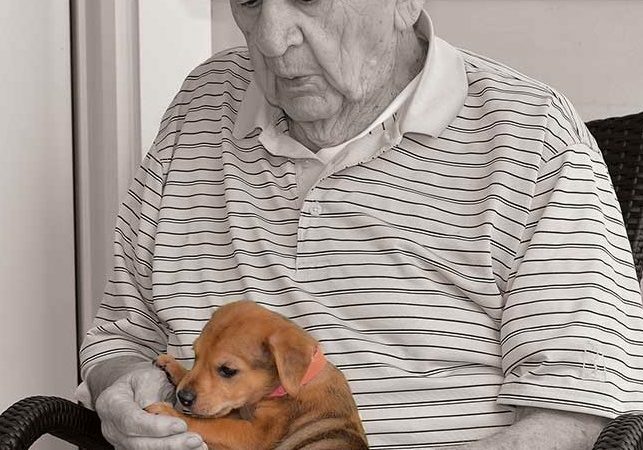 The APA appoints a foster coordinator and provides all of the dog food – Best puppy food (we recommend), bowls, collars and other essentials to Stonecrest, but the seniors are responsible for perhaps the most important thing: love. And boy, do they interact. Javier says that residents play and cuddle with the puppies in common areas or outside, “checking out” a dog like a library book. Assistants keep track of the pairs and help with cleanup duties. Seeing the bonds that the seniors make with their new furry friends is heartwarming, and though the program just debuted in April, Javier already has plenty of stories. “One gentleman was sharing how he always had animals growing up as a boy, and this really took him back to his childhood and made him feel young again,” Javier says. “He said that he and his wife spend every moment that they can get with the puppies. But puppy love isn’t the only thing the seniors are getting out of the APA’s partnership with Stonecrest. Studies have shown that animals can be therapeutic for humans, bringing a healing comfort to those with difficult medical needs. Interacting also keeps residents’ joints limber and often brings reserved folks out of their rooms to socialize more frequently. Javier says that the residential program has been a win for the APA. At its adoption center, the nonprofit organization already has seen more than 600 puppies come through for adoption in 2017, and it receives an influx of animals during the warmer months, so building its program with Stonecrest has been helpful. The APA hopes to add kittens to the senior foster mix soon, plus Javier says that once employees fine-tune details, they’ll be expanding the residential program to other facilities. “We’re currently doing orientation with two additional facilities, both of which are almost ready to receive their puppies or kittens,” Javier says. Volunteers and foster pet parents are the lifeblood of the APA, Javier says, and that’s what will bring the nonprofit closer to her dream scenario of every adoptable animal having a safe and loving home. “We know that we need help from the community, we need help from volunteers, and we need help from people willing to open up their homes and their hearts to foster these animals until they can get to their forever homes,” Javier says. 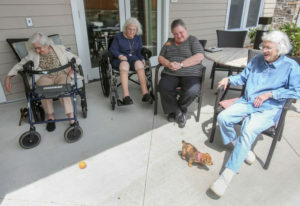 “We also know that for the senior living residents, it brings so much purpose and joy to their lives, so we’re really helping people and pets at the same time.